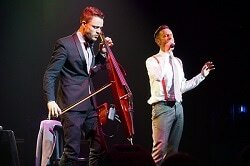 "...Branden & James put on a show playing classical covers of pop songs covering The Beatles, Elton John and Simon & Garfunkel to Andrea Bocelli, Josh Groban, Phantom of The Opera, Broadway hits, The American Songbook, etc. and occasionally throw in an original one or two more current songs such as Adele, Sam Smith, etc. They tell comedic stories about their lives- Branden's time on America's Got Talent, and their musical upbringings (Branden's grandfather toured with Johnny Cash and Elvis Presley for years and years). They are both pianists and feature all of their talents in the show, so there is quite a lot of variety."